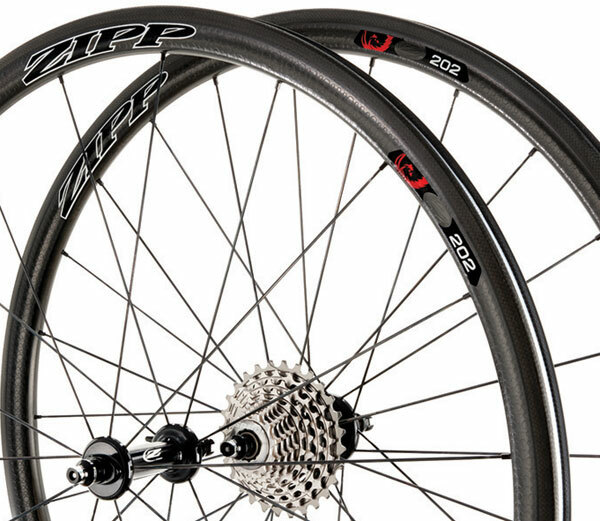 Making it a royal flush of carbon clinchers in Zipp’s range, 2013 sees the introduction of the 202 in the wide rim shape that they call Firecrest CCL. Previously the 202 was seen almost exclusively as a climbers wheel but the Indianapolis based company was at pains to give those looking for the lightest wheel the option of a something very aero too. In fact Zipp’s press information states that the 202, despite being just 32mm deep, is ‘more aerodynamic than just about any aero wheel of any depth from 10 years ago’ – the understanding of how air flows around bike wheels has moved on that much. And the weight is still pretty exceptional at 1370g. To make these advances Zipp’s engineers have had to concentrate on getting the tyre to be used as part of the aero surface of the wheel this has meant opening the rim out to increase rim width to 24.5mm at it’s widest point. The effect of this is to make the sides of the clincher tyre more vertical just as has been done on previous Firecrest carbon clinchers. Obviously with the 202 being the shallowest of Zipps carbon rims it has the lowest side force figure when in a side wind, that is to say it’s the least effected by side winds. Along side this is the notable effect that the centre of pressure now sits almost directly on the steering axis of the wheel so that cross winds have minimal effect on the steering. Zipp expect to start shipping worldwide from October. Pricing is broadly in line with the rest of the Firecrest CCL wheels so expect to pay £2300 for pair. We’ve looked at the Firecrest concept before but in case you missed it lets run it by you again. Traditionally deep section wheels have reduced drag but making the leading half of the wheel aerodynamic and thus reduced drag, the second leading edge (back half of the wheel) wasn’t really considered. In the broad Firecrest shape Zipp has made the second leading edge aerodynamic too. This reduces overall drag of the wheel as it better incorporates the tyre into wheel package.